When we (finally) arrived in Galveston and checked into our hotel, Jess was antsy to get down to the beach, which was only a block away. It's been six years since she's seen the ocean, and she was eager to get her feet wet. A few hours later, the crazy "call me" boys from Texas stopped by the hotel room to say hello. They turned out to be three college kids from Dallas, who were just wrapping up their spring break. Very nice, polite and respectable young men. The next morning, we headed for the pier, and Jess watched the luggage while I went to long term parking for the van, which cost about half what it cost to book the cruise. Okay, that's an exaggeration. 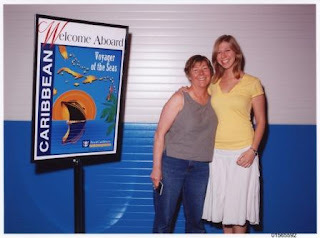 Of course, they had to take a picture of us as we 'embarked' on our journey. I feel ridiculously short. Anyway, we headed straight for the buffet, because we were ravenous, and our cabin wasn't ready yet. First face stuffing of the cruise. After we got into our room and got settled, we headed to the deck for a little pink drink with an umbrella and watched as we sailed away. We were really looking forward to this being our home for the next seven days. Tomorrow: uh, define 'gale force' for me again. Oh man, I'm already jealous. Gee, I wonder why the college boys are hanging around. Duh. Ahh, I love Galveston. Spent many a week there playing at the historic Hotel Galvez. It's one of the future vacation destinations on my list. heather - It was really neat, however . . given your condition and the way the boat was rocking, I think you may reconsider on upcoming posts! jeff - Obviously it was a Mrs. Robinson situation. What else could it be??? Last time we went to Galveston, we flew in. This time we got to drive around some. Wouldn't mind having one of those houses on the beach. Hmm...I posted a comment this morning, but it must not have gone through. Anyway, I cannot believe how much Jess looks like you. Until I was looking at that picture of you two standing next to each other, I hadn't realized. She sure is beautiful, which of course means you are too! tracy - People are always telling the poor kid she looks like me. I will go so far as to say she looks like I USED to look! Yeah I don't know who is more beautiful, my little sister or my young mother!! !